This post is by Andrew Browne, co-founder of Amazon private label split testing and pricing optimization tool Splitly. Conversion rate optimization (CRO) is one of those terms that is widely used in the digital marketing and ecommerce world. On the most basic level, it means to optimize your website or webpage for higher conversions. The end goal is to increase the percentage of visitors to a website that “convert” into customers. So as an Amazon seller, this translates to improving your product listing for greater conversions, meaning more sales and more profit. How Amazon listing conversion optimization works. How you can do it. Some actionable takeaways to improve every area of your product listing. How does conversion optimization work for Amazon sellers? First up, you can just go ahead and start making changes to your listing, or adjust your pricing manually, and see how this affects your bottom line. This is ideal if you know you need to make changes and improve your sales velocity, but you aren’t too concerned about getting statistically accurate results. I recommend you change just one element of your product listing at a time, then monitor your sales in Seller Central for a couple of weeks, so you can make a clear judgment on whether it’s had a positive effect. Just be aware that there are a lot of moving parts on Amazon, so an increase or decrease in sales could also be attributed to seasonal fluctuations, competitor behavior or changes in your sales rank (BSR). This is the most accurate way to find out exactly how each change you make to your product listing affects your overall sales and profits. In the conversion rate optimization world, this is known as split testing, or A/B testing. This is where you utilize software to automate side-by-side tests, directly comparing one version of your listing against another. These tests typically run for a couple of weeks, or until the data reaches statistical significance, meaning that one version of the test has conclusively outperformed the other. In other words, it shows that the results are not just down to chance. Tip: If you’re stuck with all of the jargon, check out our Amazon Split Testing Glossary. Why should Amazon sellers consider optimizing their listings? Whichever route you choose, optimization is an increasingly important part of being an Amazon seller these days. It’s particularly useful for private label sellers, who “own” their listing and the Buy Box. (Technically, Amazon own both of these, but private label sellers have much more control over the outcomes of their listing). Finding out what makes your listing perform better is a very powerful tool that will help you stay ahead of your competition and increase your profits. As business owners, we can all agree that this is an important goal. It’s also an effective tactic now that incentivized reviews are no longer allowed, after the TOS changes back on October 3rd, 2016. Though it is possible to employ other tactics that help increase your organic product reviews, optimizing your listings can only improve your overall Amazon marketing strategy. What should you be testing for higher conversions and profits? This is the fun part that you have been waiting for. What exactly can you change on your product listings that will improve conversions? And more importantly, how should you change your listing content to have a positive impact? Everything I know and have learned about Amazon listing optimization leads to the following conclusion: changing your pricing is the most powerful test of all. Optimizing your pricing should not be a one-time thing, either. As I mentioned previously, there are many moving parts to Amazon. Seasonality and competitor pricing may dictate that your “optimum” price is different this month to what it will be two months from now. If you are going to test your pricing, use Weber’s Law! The just noticeable difference between two stimuli is directly proportional to the magnitude of the stimuli. This essentially means that a small change is not noticed by most people. So you should change your price in small increments to avoid any unwanted side effects. Whether you are considering testing a lower or higher price, start with a 10% difference. Once you have a winner you can adjust by another 10%, and keep going until you have your optimum price. When testing a higher price, you need to ensure that a potential decrease in sales is compensated for by the higher profit per unit. Likewise, when testing a lower price, you need to ensure that the loss of profit per unit is compensated for by a large enough increase in sales velocity. Try an unusual price point, for example, rather than $19.99 or $19.95, try a unique value like $19.87. It can work! They say that a picture speaks a thousand words, and in ecommerce this certainly bears some truth. Your product photography is the closest your customers get to seeing the real thing – so it’s important that your images show the product in the best way possible, and in as much detail as possible. So, unsurprisingly, our data shows that testing your main image is the next most effective optimization hack after pricing. However, it’s no good just deciding which image you think is the best. It’s better to let the sales figures tell you what works. Even slight changes in your images can have a huge impact on your bottom line. There’s a good example of that later in this post. Try some images that really add value, for example, show the product in use, or illustrate it’s size by showing it being held, or alongside other objects. Next up, you might want to consider optimizing your listing copy and content. Remember that your product features (bullet points) are a digestible format for potential customers to get a snapshot of how your product is going to benefit them. Try to position a feature in a benefits-driven way – how will this help the customer? Any differentiating factors or features between your product and your competitors’ products should be pointed out. Experiment with both longer and shorter bullet points, to discover what works best for your listing. Many private label sellers don’t think that their description plays a big part in conversions and sales. This common misconception could cost you dearly! 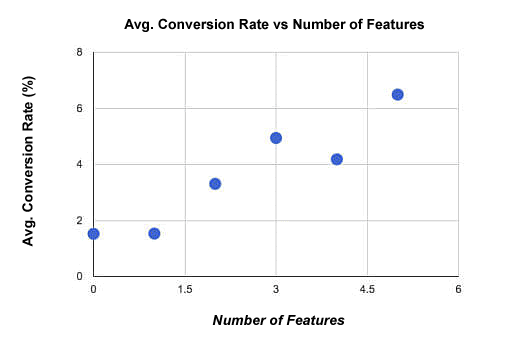 Generally speaking, products with longer descriptions have a higher conversion rate. But there are some outliers, so you need to find out what works for each of your listings. Don’t assume that customers will not read your description! Try to use a narrative that allows the reader to picture themselves owning this product. Help them understand how it would change their life. Describe how the product is used. For example, you could tell a story about the product being used by a fictional person who fits the target customer criteria. I want to share a few real-life examples where Amazon sellers have seen great results after optimizing their listings. There was a 58% increase in the conversion rate. Daily sales went up by 77% (from 23 units per day to 40). Overall, this price decrease made the seller $88 more profit every day. This more than compensated for the loss of profit per unit. In fact, it has the potential to boost profits by up to $30k per year! A different seller simply tried a front view for their lead image instead of an angled shot, and saw some profound results. Who knew that such a small difference could make a huge impact? Daily sales more than doubled, and most importantly, daily profit was up by an average of 90%. All because the seller had the initiative to test their assumptions with which lead image was most appealing to consumers. What if my sales decrease after I change my listing? Sometimes, new images or features that you thought would make a huge improvement may actually decrease your sales. Although this can feel disheartening, remember to stay positive and simply switch it back. All information about what works and what doesn’t work is equally valuable. Use the knowledge gained to guide your future tests. Optimizing your listing is an underestimated opportunity for Amazon sellers to get ahead in 2017. If you do nothing else, simply try to improve your listings with some of the tips in this article. Even better, keep a close eye on the results or start running some split test experiments to support your decisions with real sales data. Have you had any success in optimizing your Amazon listings? Let me know your thoughts and questions in the comments! Andrew Browne is a software developer and Amazon seller from Ireland, and the co-founder of Amazon split-testing tool Splitly. In his spare time, Andrew is constantly searching for travel adventures, greasy burgers, and all things tech. Splitly is also listed in the Web Retailer directory: Splitly listing. The price change downward is a race to the bottom. It doesn’t benefit the saller, only the platform owner (AMZ) because the product sells. But the seller doesn’t make much of a profit if they continually price downward. I agree with you, Sally. The lower price mentality is a large problem with sellers on Amazon and brand degradation over the long run (you’re playing into Amazon’s game of just making transactions happen to collect their fees). Focus on quality products, optimized listings, and marketing while maintaining the integrity of your brand and demanding a premium price. People will pay for quality and your reviews will reflect positively. Kym from the Splitly team here. You are correct that any decrease in price needs to be carefully monitored to ensure it does not affect your profits, or indeed the perceived value of a product. Having said that, we have seen lots of our users decrease their pricing in small increments (10% or less as this Andrew suggests in the article), and increase their sales velocity so much that they have actually increased profits substantially. This usually doesn’t cause too much of a race to the bottom as it’s in small increments. That’s not to say you shouldn’t also test an increase in price too. Optimum price (for the most profit), for any given product on AMZ will vary, and it will change over time too. Peter hit the nail on the head, it’s always a good idea to focus on the quality of your product, optimized listings and marketing! Even if you get all of this right and offer a product at a premium price, it’s still worth ensuring this price is optimized for maximum results! I will add that this scenario can be utilized effectively as long as it is not at the expense of your B&M retailers or violating MAP and used more as a pro-active strategy (which can be coordinated with retailers), rather than a reactive answer to another seller dropping the price (the race to the bottom begins!). Overall, just trying to maintain brand integrity and be fair to other distribution channels.